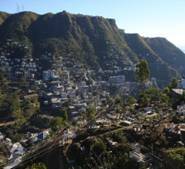 Aizawl the capital of Mizoram state in northeast India is surrounded by hill ranges. This is one of the largest city of the state oriented more towards its cultural and religious values. It lies at an altitude of about 2,950 ft high on a ridge. Most of the people living here are the origins from the neighbouring country Burma. Aizawl flanked more rivers and rapids are surrounded by the Durtlang Hills in its south. Being surrounded by hills on almost all sides the state is very pleasant. Aizawl though does not have a special history the state on the whole; Mizoram ranks second in the country for its literacy rate.Mioram which is a Union Territory now was initially under the control of Assam. Christianity is the dominant religion of this place and almost of the people here can speak English. Chapchar Kut is the festival celebrated in the month of February to March during which the fields and the jungles are weeded and cleared for the next sowing to start. Pawl Kut which is the major harvest festival is celebrated during the month of December. Mim Kut is another major festival of this area during which they pay homage to their departed souls and also a sort of thanks giving for the maize harvest. This festival falls in the month of September. Other festivals celebrated in this area include Christmas and New Year's Day. This museum has exhibits of historical and antique collections including costumes, implements; etc.It is situated at Mc Donald Hill in the town center of Aizawl. This is a very small but still has rare collections of birds and animals found only in the hills in and around this place. 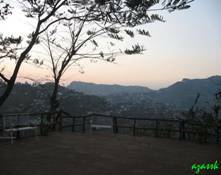 This place which is at a distance of about 7 kms away from Aizawl City center is just a place for amusement and fun which has small eating joints and housed with cottages for the tourists. Falkan about 18kms south of Aizawl attracts most of the tourist for it exhibits the life and lifestyle of a typical Mizo Village. This is a place more for those who are nature lovers and who would love to go for an adventurous trek. This place is fully surrounded by forests. 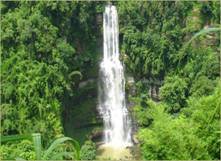 It is situated at about 35 kms from Aizawl. 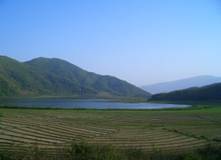 Tam Lake is situated amidst of beautiful green forests which are a best place for one day picnic. The journey to this place gives you a chance to see splendid scenery of nature. 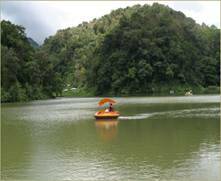 It is at about 85 kms east of Aizawl.The lake also provides boating facilities. This waterfall is just about 5kms away from the Thenzawl town and it is one of the highest waterfalls of the state. This can also be accompanied by shopping of handloom products in the neighbouring town of Thenzawl. The waterfall is fully surrounded by dense bamboo grooves. Champhai which is full of paddy fields is widely called as the Rice Bowl of Mizoram.It lies in an elevated point of about 1678 mts high and from here it gives a beautiful view of the hills of Myanmar. The town of Champhai is developing at very fast rate for it will become the centre for the Indo-Myanmar border trade.Champhai is at a distance of about 192 kms away from Aizawl. Phawngpui is also referred as Blue mountain is located in the district of Saiha which is about 300kms away from Aizawl.This place being located in the highest elevated point of the state is rich medicinal herbs. It also attracts the tourists for its rare variety of birds, animals and orchids and plants grown in the wild. Saiha which is a district headquarters is more of a culture depicting area of the state. This place is best known for tourist attraction for it has the biggest river, Chhimtuipui River of the state running in it. At about a distance of 109kms away from Saiha are other places of interests like the Palak lake and a wildlife sanctuary. There are no foreign embassies located in Aizawl, but the nearest one is in New Delhi. 1. Bara Bazaar - garments, cosmetics, shoes, vegetable and poultry. 2. Zohanco in Zarkawt - Handicraft items, shawls, puan, bags and home furnishing materials. 3. MKVI, Sales Emporium in Zarkawt - bamboo worked handicrafts, bamboo baskets and all kinds’ bamboo items. 4. Solomon’s Cave - Imported garments, cosmetics and shoes. 5. Luangmual Handicrafts Centre - handicraft items and the specially made 'Khumbeu'hat. By Air - The airport is equipped with domestic flights where there are regular flight services offered by Indian Airlines between Aizawl and Calcutta. By Rail - The major and the nearest train station at Lumding, is about 180 km north of Silchar. By Road - Mostly people visiting Aizawl come by road for there is a National Highway between Aizawl and Silchar.There are number of private transports which operate over night along with the state transports in the day time. The minibuses that run between central Aizawl and the suburbs head from the top of town near the GPO and Zodin Square to Chandmary in the north.